You Are Here: Home > Learn the 6 Steps to Buying a New Toyota with This FREE eBook! 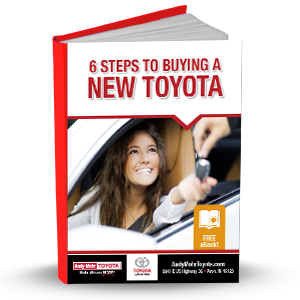 Learn the 6 Steps to Buying a New Toyota with This FREE eBook! So, you’ve had your eye on a shiny new Toyota here in the Avon, Indianapolis, and Plainfield areas. With all the safety, entertainment tech, and great performance features they come with, we can understand why. Six steps. That’s all that stands between you and a new Toyota. Pretty exciting, isn’t it? Read this simple eBook, and you’ll be closer yet. Download yours today!